Quality Auto Center is honored to present a wonderful example of pure vehicle design... this 2015 Cadillac CTS Sedan Premium AWD - CARFAX Certified 1 Owner - No Accidents - Fully Serviced - QUALITY CERTIFIED up to 10 Yrs / 100,000 Miles Warranty only has 39,830mi on it and could potentially be the vehicle of your dreams! This Cadillac includes: ENGINE, 3.6L V6, DI, DOHC, VVT Flex Fuel Capability V6 Cylinder Engine KONA BROWN WITH JET BLACK ACCENTS, FULL LEATHER SEATS Woodgrain Interior Trim Leather Seats BLACK DIAMOND TRICOAT CADILLAC CUE INFORMATION AND MEDIA CONTROL SYSTEM WITH EMBEDDED NAVIGATION AM/FM Navigation System AM/FM Stereo Auxiliary Audio Input MP3 Player SEATS, FRONT BUCKET, 20-WAY PERFORMANCE DRIVER AND FRONT PASSENGER Power Passenger Seat Power Driver Seat Bucket Seats *Note - For third party subscriptions or services, please contact the dealer for more information. * You deserve a vehicle designed for higher expectations. This Cadillac CTS Sedan delivers with a luxurious, well-appointed interior and world-class engineering. Simply put, this all wheel drive vehicle is engineered with higher standards. 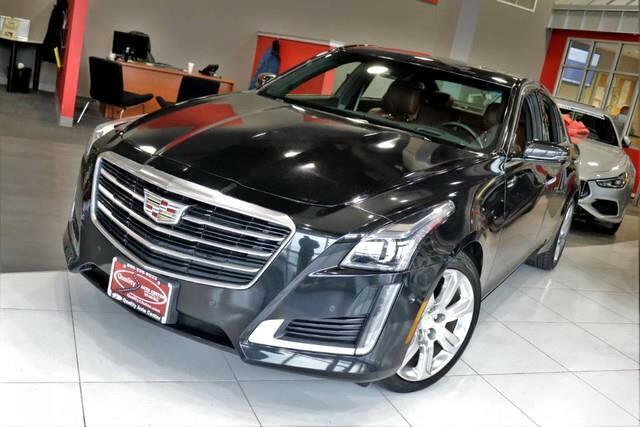 Enjoy improved steering, superior acceleration, and increased stability and safety while driving this AWD CadillacCTS Sedan Premium AWD - CARFAX Certified 1 Owner - No Accidents - Fully Serviced - QUALITY CERTIFIED up to 10 Yrs / 100,000 Miles Warranty. It's not often you find just the vehicle you are looking for AND with low mileage. This is your chance to take home a gently used and barely driven Cadillac CTS Sedan. This Cadillac CTS Sedan offers the most up-to-date navigation system available so you'll always know the most efficient route to where you are going. Added comfort with contemporary style is the leather interior to heighten the quality and craftsmanship for the Cadillac CTS Sedan More information about the 2015 Cadillac CTS Sedan: The Cadillac CTS is a mid-sized luxury sedan in competition with the 5-series BMW and the Mercedes Benz C-Class. Through extensive use of technology and chassis design, Cadillac is hoping to please both those looking for a pure luxury car and those who want a little bit more sport with their upscale sedan. This model sets itself apart with packed with new technology, Luxurious, spacious, powerful engines, and good handling No Credit / Bad Credit / No Paystubs, No problem !! ! All Approved ! Everyone drives ! CLEAN, GORGEOUS, LOW MILES, SHOWROOM CONDITION. CALL NOW QUALITY CERTIFIED up to 10 YEARS 100,000 MILE WARRANTY , To Certify a vehicle, there will be an additional cost for Certification. CALL NOW For details. STUNNING AGGRESSIVE LOOK ON THIS BEAUTIFUL--Call today to schedule a test drive... Good Credit/Bad Credit/No problem!!!! Get paid cash? No problem!! 100% Credit Approval with interest rates starting at 2.49% for qualified customers, our rates will not be beaten. We price our cars at wholesale price to guarantee the best deals for our customers. Our inventory moves quick, please call to confirm the availability of the vehicle of your interest Springfield location 973-564-0112. This vehicle is located at our SPRINGFIELD location. Come visit our new showroom in Springfield NJ.